Precious friend, have you fallen lately? Have you said something or done something that you regret–something that you know is beneath your privilege as a child of God? If so, you are not alone. We all fall sometimes. I sure do, and I wish I didn’t. You probably wish you didn’t too! But you know what? We have a precious, merciful, loving Papa in Heaven who loves us so much that He helps us get back up again. He is mindful that we are but dust“ (NASB, emphasis mine). He knows your frame. 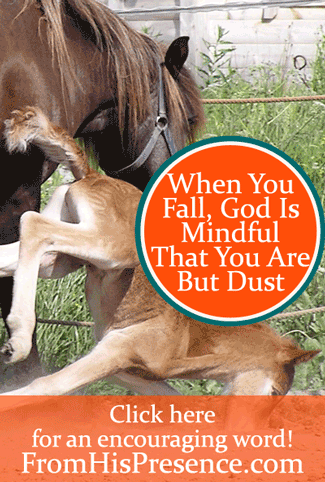 God is mindful that you are but dust. Does this give us an excuse to sin more because we’re only made of dust? No, of course not. But it does give us such a precious glimpse of our Father’s heart. Can’t you see Him now? You may have fallen, but the Father is extending His hand to you with pity and compassion. He loves you so much. He knows you far more intimately than you know yourself. 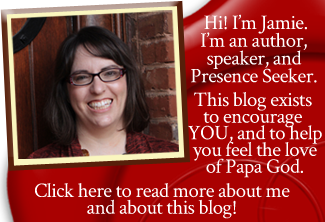 You are His baby, and He knows you’re not perfect yet–but His heart beats for you anyway. He adores you. And He is picking you up. He wants you to get right back up and get back in His lap. You are His beloved son or daughter. When we sin, yes, of course repentance is needed. We have to make things right with those we have wronged. But as soon as we repent and ask Papa to forgive us and wash us clean with the blood of Jesus, He does. He forgives. He cleanses… and He forgets about it. Why? Because Jesus made a way on the cross for your sin and mine to be forgiven and forgotten. We need that – because we are dust. And God knows it. So when we repent, God forgives. And He looks at us just the same as He did before we sinned–as the righteousness of God in Christ. You are worth the sacrifice that Jesus made for you, because our Papa values you that much. He loves you that much. God is mindful that you are but dust, but He loves and forgives and restores you anyway. So have you fallen? Precious sister or brother, after you have repented and made things right, it’s time to get back in the Father’s lap. He will forgive, and He won’t hold it against you. He is mindful that you are but dust, and His heart beats for you anyway. Image courtesy of Smerikal on Flickr via Creative Commons license. Thank you, Pat. Love you bunches. <3 Thank you for reading! Jamie, I thank you for this encourage word. God is really using you. You are truly my Angel. This is how I was feeling I made some bad mistakes. Now I am praising him. I love you so much. Be bless. Mrs. Millie ??? I thank God for you and for giving me understanding of his love and words of comfort I truly needed to hear.